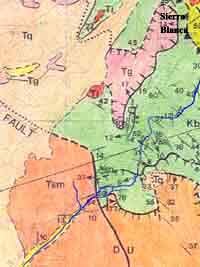 The map at left (see Goodlin & Mark in Credits & Bibliography) shows the major geological divisions of the areas transected by this Wash. (Click on the image to enlarge it.) The lower part of the wash is at far lower left of the image, and the formation marked in beige there is the Quiburis (Tq). 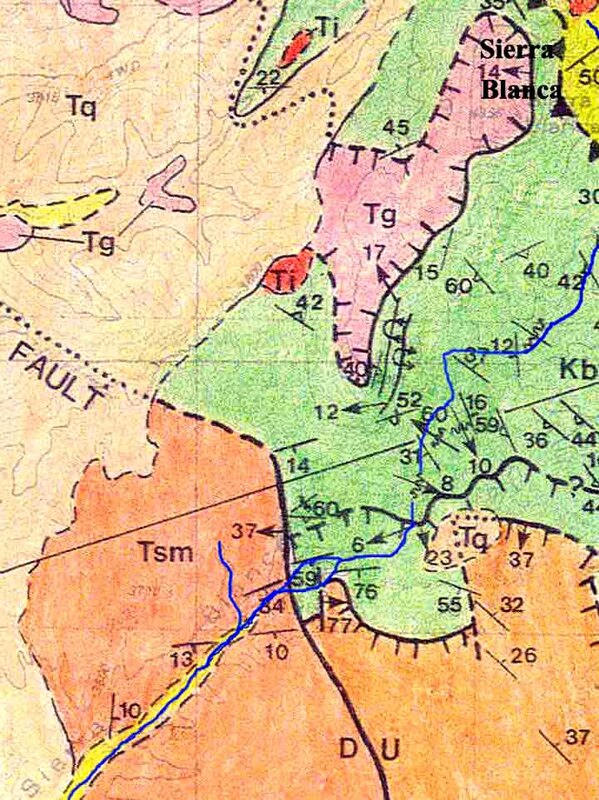 Moving upstream, you cross a boundary with the San Manuel Formation (Tsm), marked in burnt orange. Further upstream, this Formation ends at the Teran Wash Fault (marked as a dotted and strong black line). Here you cross a boundary with the Willow Canyon Formation (Kb), marked in green. At far upper right, with Sierra Blanca looming to the northwest, you cross the boundary with the Cascabel Formation (Kc), marked in yellow, where the saw-toothed line of the Hot Springs Canyon Thrust Fault is just visible at far upper right of the map. For details, see the links listed below.